English animal painter (animalier) best known for his paintings of dogs. (1837) By Sir Edwin Landseer. Edwin Landseer was an important contributor to English painting and sculpture, specializing in animal subjects (dogs, horses, and stags). He was a very popular figure in Victorian art, and enjoyed significant social as well as professional success. He was elected to the London Royal Academy at the age of 29 and knighted at 48. He was friends with the writers Dickens and Thackeray, became the favourite painter of Queen Victoria. Best known for his portraits of dogs, his tendency to humanize his subjects in order to add sentimental narrative to the picture, horrified art critics like John Ruskin (1819-1900), but delighted the public. 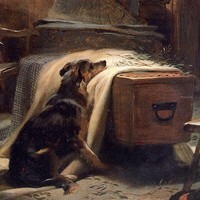 Masterpieces of his particular brand of canine portrait art include: "The Old Shepherd's Chief Mourner" (1837, Victoria and Albert Museum), and "Dignity and Impudence" (1839, Tate Britain). His most famous portrait of a stag is probably "The Monarch of the Glen" (1851, Diageo Collection), while his finest horse painting is probably "Shoeing" (1844, Tate Collection). A great deal of his fame as well as his wealth was generated by the sale of engraved copies of his animal paintings, many of them by his eldest brother Thomas Landseer (17981880). In addition to his work as an animal painter, he also produced a quantity of history painting - see his fresco entitled "The Defeat of Comus" (1843, Buckingham Palace) - and landscape painting - see "A Lake Scene Effect of a Storm", 1833, Tate Britain) - and human portraits. In 1858 he was commissioned to create an important bronze sculpture, consisting of four huge lions for the base of Nelson's Column in London's Trafalgar Square. Designed by Landseer, they were cast by his friend Carlo Marochetti (1805-67) and unveiled in 1867. Sadly, for most of his adult life, Landseer was afflicted by mental problems aggravated by drug and alcohol abuse. He was eventually declared insane in July 1872, at the request of his family. Born in London, the son of the writer and engraver John Landseer A.R.A. (17691852), he was an infant prodigy who learned drawing from his father, and oil painting from several artists, including the history painter Benjamin Robert Haydon. It was Haydon who encouraged him to attend post mortem dissections of animals to familiarize himself with animal anatomy. In 1815, the thirteen-year old Landseer exhibited his first paintings at the London Royal Academy, where he was elected an Associate at the age of 24, and an Academician five years later. He was knighted in 1850. Later, in 1865, he was elected president of the Royal Academy, but declined for health reasons. In addition to animal art, his early work involved a variety of media, including illustration (in 1828 he was given the commission to illustrate the Waverley Edition of Sir Walter Scott's novels); etching and genre-painting ("An Illicit Whisky Still in the Highlands", 1829, The Wellington Collection, Apsley House). Furthermore, he also excelled at plein-air painting: his small-scale outdoor sketches are as good as anything produced by John Constable or the Barbizon painters. See also: English Landscape Painting (1700-1900). Landseer's appeal as an animal artist (animalier) transcended all class barriers: prints of his pictures were a popular feature in many middle class homes, while he was also much sought after by high society, even royalty. This was partly because his animal images expressed some of the underlying virtues of the Victorian era: nobility, pride, courage and conquest, along with male dominance and female subservience. Queen Victoria gave him numerous commissions to paint various royal pets, as well as several ghillies and gamekeepers working on the royal estates at Balmoral and Sandringham. Indeed, in 1840, Victoria commissioned a double portrait "Queen Victoria and Prince Albert at home at Windsor Castle in Berkshire, England" (1840-43, Royal Collection, Windsor Castle), as a gift for Prince Albert. A regular visitor at court, Landseer painted portraits of Victoria's babies with dogs, and taught the rudiments of etching to both Victoria and Albert. He also painted several social portraits of Victoria and Albert and several equestrian portraits of the Queen - "Queen Victoria at Osborne House" (1865, Royal Collection, Buckingham Palace) - which was hung at the Royal Academy. Please see also: 19th Century Portrait Paintings (1800-1900) and English Figurative Painting (1700-1900). 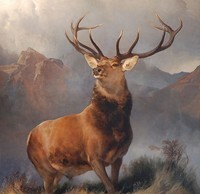 Landseer had strong links with the Scottish Highlands, which provided the subjects and backdrop for many of his works. Examples include his genre paintings, "A Highland Breakfast" (1834, Victoria and Albert Museum), as well as "Flood in the Highlands (1860, Aberdeen Art Gallery); his historical work "The Hunting of Chevy Chase" (1826, Birmingham Museums and Art Gallery), based on the Ballad of Chevy Chase and the Battle of Otterburn (1388). One particular work from his later years caused considerable controversy because of its subject matter and composition. Entitled "The Shrew Tamed" (1861, Private Collection) (also known as The Pretty Horsebreaker), it showed a mature horse on its knees among straw in a stable. Lying alongside, a lovely young woman lightly strokes the horse's head with her hand. Although described as a portrait of the equestrienne, Ann Gilbert, demonstrating the calming techniques of the celebrated 'horse whisperer' John Solomon Rarey, art critics were troubled by the juxtapositioning of a young woman and a virile horse, as well as the former's real identity. For other Victorian painters, see: the history painters Paul Delaroche (1797-1856) and Daniel Maclise (1806-70); the Romantics J.M.W.Turner (1775-1851), John Martin (1789-1854) and Edward Burne-Jones (1833-98); the academic artists Frederick Leighton (1830-1896) and Lawrence Alma-Tadema (1836-1912); the American 'Impressionists' Whistler (1834-1903) and John Singer Sargent (1856-1925); and of course William Powell Frith (1819-1909), whose Victorian genre paintings provide a populist snapshot of Victorian times. Despite his versatility as an artist, Landseer's principal claim to fame were his portraits of dogs. His pictures of Newfoundland rescue dogs, for instance - such as "Off to the Rescue" (1827), "A Distinguished Member of the Humane Society" (1838, Private Collection) and "Saved" (1856, Private Collection) - were so popular that the name "Landseer" became the official name for the breed. 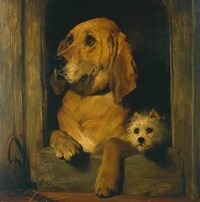 Other famous works by Landseer included the sentimental "Old Shepherd's Chief Mourner" (1837, Victoria and Albert Museum); and the satirical "Laying Down The Law" (1840), which shows a group of dogs, with a poodle symbolising the Lord Chancellor. In 1858, following their rejection of Thomas Milnes' stone sculpture of four lions for the base of Nelson's Column in Trafalgar Square, the British government commissioned Landseer to design four bronze lions. With the help of casts from Turin and the efforts of the sculptor Carlo Marochetti, the lions were finally installed in 1867. Landseer died on 1 October 1873 and was buried in St Paul's Cathedral. His passing was widely acknowledged across the nation. Flags flew at half mast, his bronze lions were decorated with wreaths, while his funeral was watched by thousands of mourners. Works by Landseer can be found in some of the best art museums in Europe including the Tate Collection and the Victoria and Albert Museum, as well as the Royal Art Collection in London. Painting movement founded by Holman Hunt, Rossetti & John Everett Millais. Popular colour pigments used in Britain and Europe. Championed by William Morris (1834-96). The Top 80 Camera Artists and Inventors. Imperial-style building designs by Nash, Paxton, Brunel and others. Famous painters, sculptors & printmakers of Ireland.  For biographies of other 19th century artists, see: Famous Painters.  For more about Victorian-era painting, sculpture and decorative works, see: Homepage.